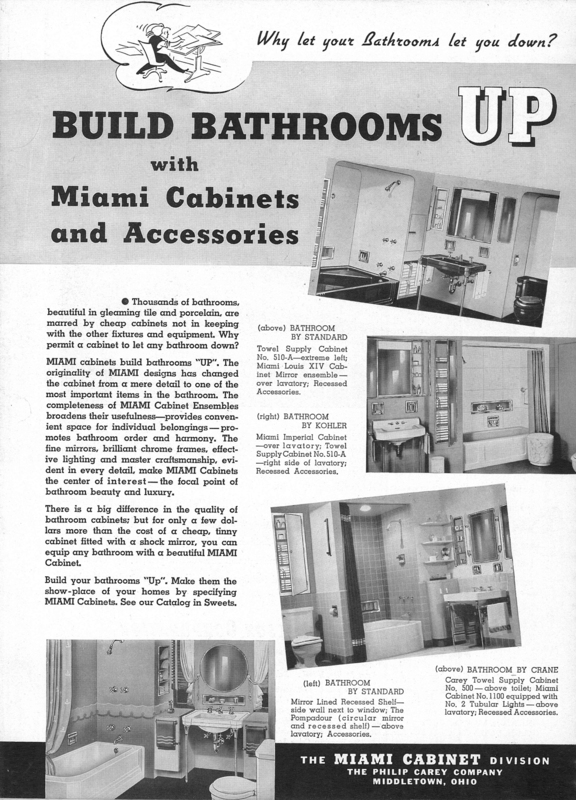 So it’s time for another round of ads from the Architectural Forum circa 1939 and 1940 but this time I am focusing on Kitchen and Bath ads. 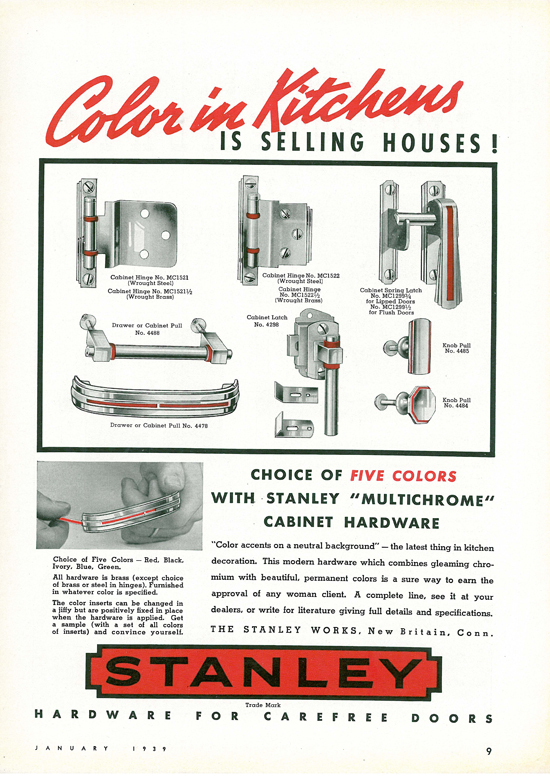 Other than white lead ads, kitchen and bath products take up more than their fair share of advertising space in these old Forum magazines. 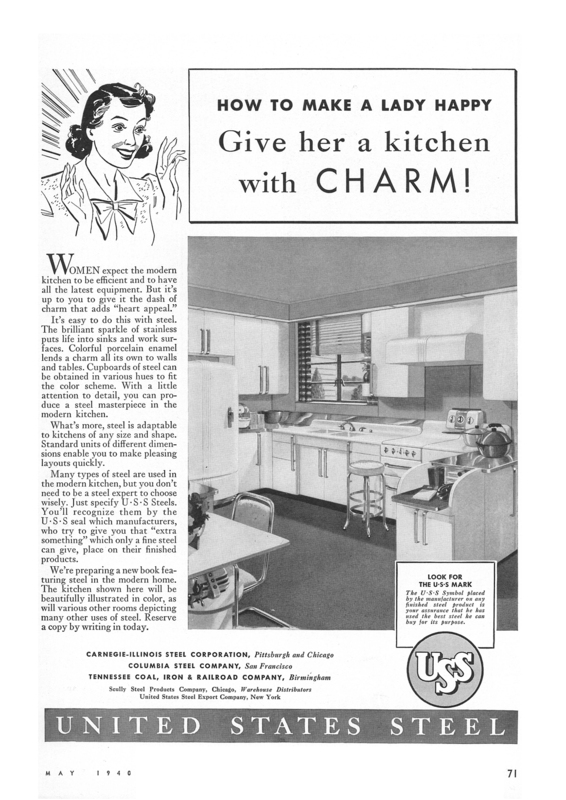 I understand that times were different and the roles of men and women were defined somewhat differently than they are today but I can help but confess that I was surprised at how gender specific these ads were. Hope you enjoy them the same why I did – with one eyebrow raised. The architect specifies it, the builder installs it, the client enjoys it. All agree … Nairn Wall Linoleum is the most modern and ideal material for walls. There is a big difference in the quality of bathroom cabinets; but for only a few dollars more than the cost of a cheap, tinny cabinet fitted with a shock mirror, you can equip any bathroom with a beautiful MIAMI cabinet. Uh-huh … what’s a shock mirror? 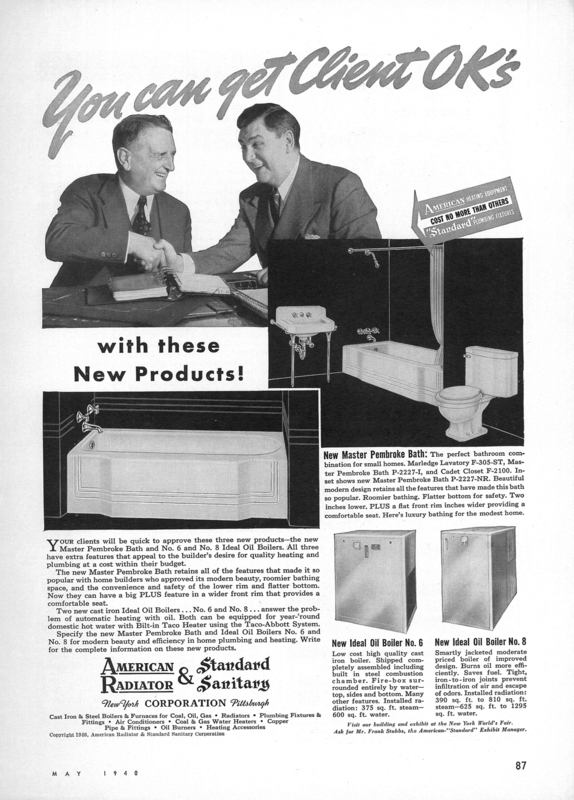 Those do all sound pretty good – that tub, with the design features they list, is a standard now. The good stuff indeed doesn’t ever change. You can have exactly what you wish whether for a luxurious or a modest establishment. For the most part, it’s not like anymore – you have your high end manufacturer’s lines and then you have modest manufacturer’s lines. 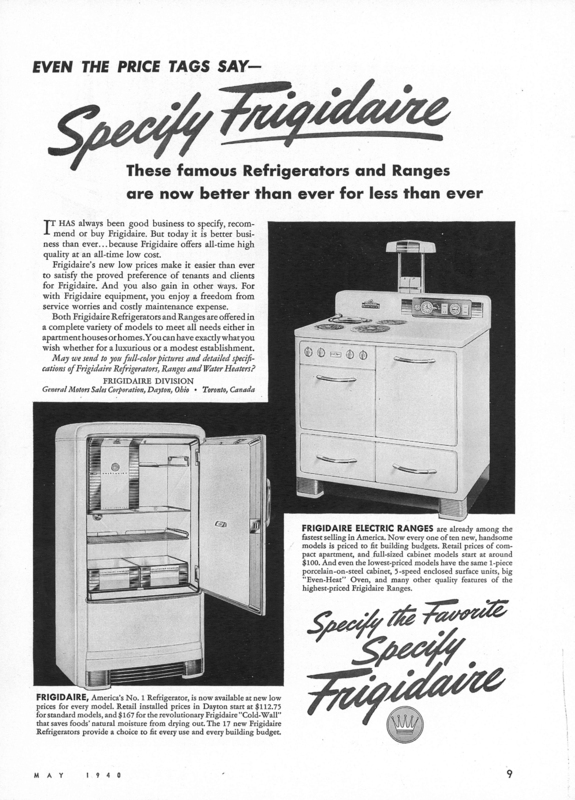 In this case, you can get installed America’s #1 refrigerator, the revolutionary Frigidaire “Cold-Wall” refrigerator for $167. How many kitchens have you planned? 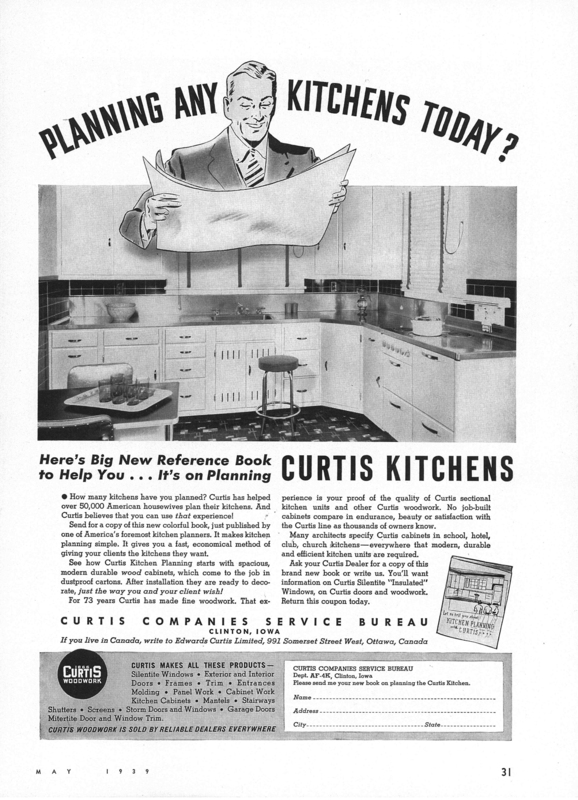 Curtis has helped over 50,000 American Housewives plan their kitchens. WOW! so 50,000 kitchens huh? Scoreboard on me, I’ve only done like 60 (sad face). So who is this Curtis Kitchens? … he sure looks like he’s have a good laugh at someone else’s kitchen drawings. So if you do the math, 50,000 kitchens works out to 1 a day for 136 years – that’s just crazy talk. I hope you have enjoyed another installment of really old and funny ads from a long time ago. I know I have.